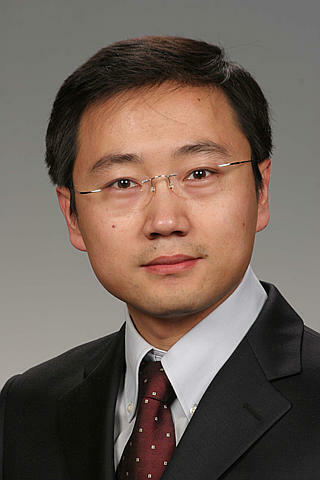 Dr. Yingge Du is a senior staff scientist in the Materials Group of the Physical and Computational Sciences Directorate. He joined PNNL in 2007 and became a staff member in 2010. He served as technical lead in the acquisition and commissioning of a new state-of-the-art oxide molecular beam epitaxy (MBE) system for the EMSL user facility located at PNNL. His current research focuses on growth and characterization of epitaxial metal oxide films and superlattices for energy conversion and storage applications. Dr. Du is the recipient of a 2016 DOE Early Career Award. This award will support him to conduct basic research that aims to understand, predict, and ultimately control cation/anion ordering and topotactic phase transitions occurring in transition metal oxide thin films. Achieving so will enable energy materials (e.g., catalysts, electrodes, and electrolytes) with desired functionalities to be designed, synthesized, stabilized, and harnessed for technological benefits. U.S. Department of Energy (DOE) Early Career Award (2016). PNNL Outstanding Performance Award (2008, 2009). Student Fellowship, University of Virginia (2005). Summer Research Institute Research Fellowship, PNNL (2004). TongFang Scholarship, Tsinghua University (2001, 2002). Chatterjee S., A. Andersen, Y. Du, M.H. Engelhard, G.B. Hall, T.G. Levitskaia, and W.W. Lukens, et al. 2017. Characterization of Non-pertechnetate Species Relevant to the Hanford Tank Waste. PNNL-26265. Richland, WA: Pacific Northwest National Laboratory. Du Y., N.A. Deskins, Z. Zhang, Z. Dohnalek, M. Dupuis, and I. Lyubinetsky. 2010. "Formation of O Adatom Pairs and Charge Transfer upon O-2 Dissociation on Reduced TiO2(110)." Physical Chemistry Chemical Physics. PCCP 12, no. 24:6337-6344. PNNL-SA-70272. Lyubinetsky I., N.A. Deskins, Y. Du, E.K. Vestergaard, D.J. Kim, and M. Dupuis. 2010. "Adsorption States and Mobility of TMAA Molecules on Reduced TiO2(110) Surface." Physical Chemistry Chemical Physics. PCCP 12, no. 23:5986-5992. PNNL-SA-68203. Lyubinetsky I., Y. Du, N.A. Deskins, Z. Zhang, Z. Dohnalek, and M. Dupuis. 2010. "Two Pathways for Water Interaction with Oxygen Adatoms on TiO2(110) Surfaces." In International Symposium on Atomic Level Characterizations for New Materials and Devices. Tokyo:Japan Society for the Promotion of Science. PNNL-SA-67667. Zhang Z., Y. Du, N.G. Petrik, G.A. Kimmel, I. Lyubinetsky, and Z. Dohnalek. 2009. "Water as a Catalyst: Imaging Reactions of O-2 with Partially and Fully Hydroxylated TiO2(110) Surfaces." Journal of Physical Chemistry C 113, no. 5:1908-1916. PNNL-SA-62836.